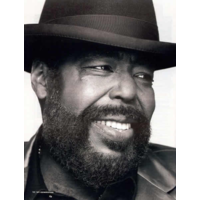 Barry Eugene White (September 12, 1944(1944-09-12) – July 4, 2003(2003-07-04)) was an American record producer and singer-songwriter. A five-time Grammy Award-winner known for his distinctive bass voice and romantic image, White's greatest success came in the 1970s as a solo singer and with the Love Unlimited Orchestra, crafting many enduring soul, funk, and disco songs such as his two biggest hits, "You're the First, the Last, My Everything" and "Can't Get Enough of Your Love, Babe". Worldwide, White had many gold and platinum albums and singles, with combined sales of over 100 million, according to critics Ed Hogan and Wade Kergan.